I LOVE bacon – who doesn’t? And I love a BLT sandwich. This salad, featured in The Skinnytaste Cookbook has all the flavors I love in the sandwich without the extra calories you get from eating it on bread! Plus it’s easy – only FIVE ingredients not counting S + P! In a medium bowl, combine the diced tomatoes with the mayonnaise, and season with a little salt and fresh cracked pepper. 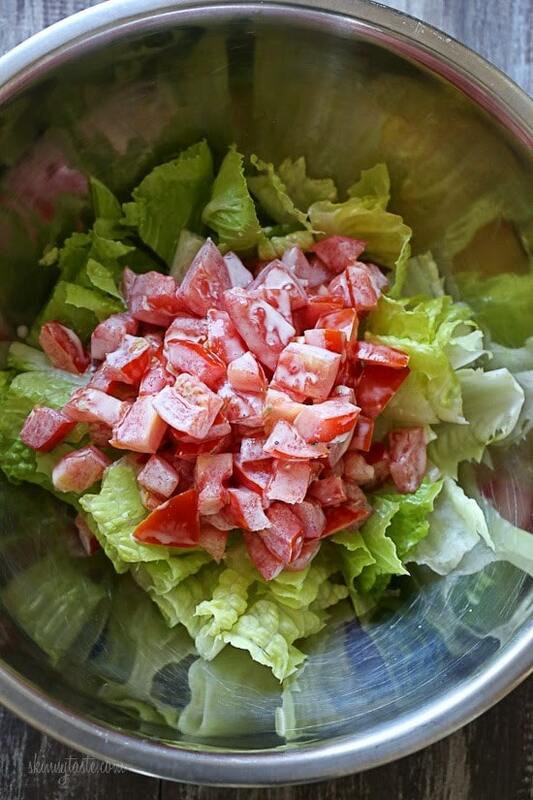 Set aside for about 10 minutes to let the tomatoes release their juices as this will be the “dressing” to your salad. To serve, divide the chopped lettuce and tomatoes onto 4 plates, then top each with diced avocado, chopped bacon and tomato mixture. I was craving a BLT but can’t eat bread and this was perfect! A few changes on my part- I used halved cherry tomatoes, no sugar added bacon, 1/2 Primal Kitchen mayo 1/2 Primal Kitchen chipotle mayo (for a bit of spice). 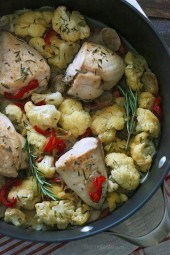 Makes the recipe paleo-friendly!!!! Processed meat is a class one carcinogen just like cigarettes. This is like posting a recipe for smoking and then telling people it is healthy. Then just keep scrolling. Why be such a troll? You know this is fabulous when your toddler asks for more salad! This was delicious! I did use turkey bacon instead (crisped in oven at 409 for 15-20 minutes) and it was so good in it! I also added an extra avocado because our family really likes avocados a lot! This made a lot and we couldn’t even finish our portion because it was so filling. 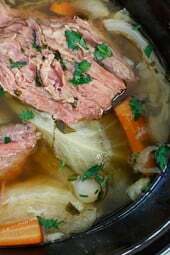 As a school teacher about to go back to work soon, I can’t wait to put this on our menu during school week because it is a fast, incredibly tasty dinner! I made this tonight and it was awesome! Both my husband and I loved it, it’s a very filling and satisfying salad! How much diced tomatoes go in the mayo, and how many chopped in the salad? This is one of my favorite salads. I don’t eat mayonnaise at all, so I substitute plain Greek yoghurt for the mayo, and it’s delicious. Thanks for another great recipe! Made this delicious salad for company alongside Porterhouse steak and creamed spinach. I ate a small bit of the filet and double portions of this salad to stay on points and man was it gooooood. Company all raved about this and NEEDED the recipe. The dressing is what makes this magic. Using the liquid from the tomatoes to thin and flavor the mayo is genius. I added a clove of minced garlic to a doubled batch of dressing and gave it a couple hours to marinate. Wow! Very flavorful. This is going to be my go-to creamy style recipe from now on. Big WINNER. Try it!! This salad is awesome! I add spinach to the lettuce for extra vitamins. I also put radishes, corn and carrots when I make it. Last but not least I sneak in chia seeds into the dressing 🙂 . Everyone always goes for seconds! Gina – how do you cook your bacon for this? Oven, microwave, or skillet? Anyway you prefer would be fine. Yum. I’m doing low carb, used full fat mayo. Love the dressing, so simple. My husband doesn’t like mayo. Any suggestions on a substitute? Olive oil, though it won’t taste the same. If I dice the tomatoes and add the mayo the night before (to take for lunch tomorrow) do you think they will be gross by the next day? Should I just bring the ingredients separated and mix at lunch time? Definitely let it sit overnight. I made a double batch and used left overs the following day in a salad and it was fantastic. (I added a clove of minced garlic to the double batch). I don't care for Romaine. Another suggestion for a different type of green? I love finding new recipes, especially ones that are healthy. Would love to win! Clean eating here we go! these tools would be amazing to have! I can't get the extra points to work…. Yay! This morning the Giveaway box allowed me to do the Pinterest Bonus point. I just ordered your cookbook this afternoon. Should have it by Wed. I am excited about getting it!! Cannot get the extra entry features to work for some reason. Will try tomorrow. Salad looks so good. Just now it finally allowed me to get the Facebook Bonus Entry. Still won't work on the Pinterest. I'll keep trying. Loks good, and I love oxo products, and cookbooks. I made this last night and it was great! I'm not usually a salad lover, but this one will return to the menu again. Salad looks very appetizing and healthy. I think I would use turkey bacon in my salad. Looks like a wonderful cookbook that would get used quite often in my household. Be nice for the winners of the cookbook be autographed by the great author and cook; if possible that is. 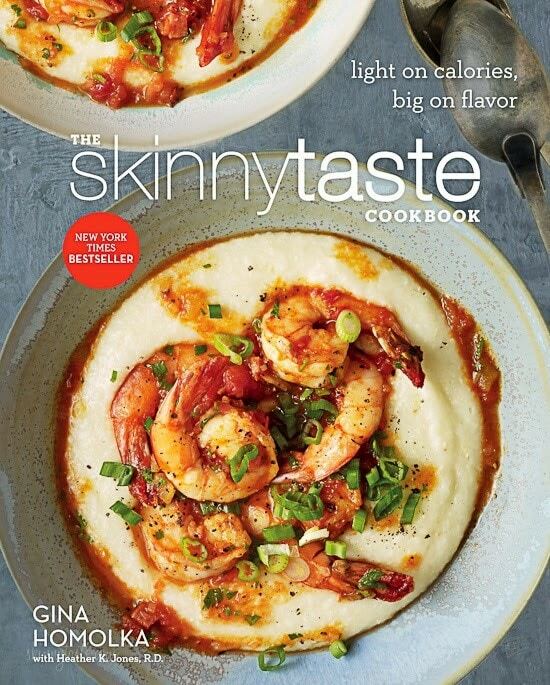 Great Recipes I can't wait to start trying! I can't submit anything else, either – just the mandatory entry. I was able to Follow on Twitter but still can't get the other buttons to work. Oh well. This looks awesome. I can't wait to try it. I had problems with the bonus entries, but hopefully I can figure it out. I followed on Facebook (name: Amanda Schenk), Pinterest (name: random sally) and Instagram (name: completelyrandomsally). Thank You for the chance!! Looks Wonderful!! All of these look so Delicious! Thanks for the Fabulous recipes! Awesome! I love Oxo and I need great healthy cookbooks to give me great recipes /directions to more then just the basics! The better the taste the more likely I will be including my little ones more often! Had this for dinner last night (with 2oz of chicken) and it was fabulous! Cooked just enough extra bacon (I used turkey bacon because it's what I had) and chicken to make a 2nd salad that I just enjoyed for lunch at the office. I added some diced scallions because I had them on hand and I like a light onion flavor in my salads. Other than that I didn't change a thing! Another great recipe Gina, thank you! Wow this salad looks like a fantastic lunch! Definitely beats PB&J every day! Thanks for the Giveaway but it doesn't seem to be working. The buttons don't work, the Twitter box isn't showing up to click, etc. I've tried to enter all the bonus entries and all of them do not work. Help! Love your site. This recipe is definitely up my alley! Made this last week from my skinny taste cookbook I got for Christmas. Delicious! 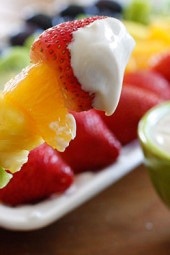 This looks absolutely delicious, I'll have to omit the Bacon because I'm on a low fat diet. Any ideas for dressing that doesn't include Mayo which would go well with the salad, I usually use lemon juice and olive oil, would that blend well? Soooo you are going to make a BLT salad minus the B, and not even use the dressing? Some of the people who comment of these recipes are ridiculous. Let me change everything that you did Gina, and then ask you if my new ideas will work. Sound good? Looks like a great salad. Thanks for the giveaway! Hi, Gina! I had to let you know that I JUST received my copy of your cookbook and I can't wait to start thumbing through it and checking out all of the delicious recipes. This salad looks like it's going at the top of my list. Congrats on the book! I am so ready for salads and this looks amazing! 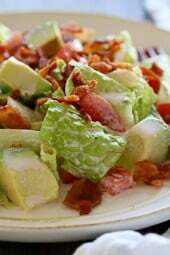 What a great simple salad recipe. I could definitely use these scissors. Much safer than my mezzaluna, I would imagine! Thanks! Half the recipe made a perfect lunch today for two….it was wonderful. I will definitely be making this again. My kids just had this for a sandwich this weekend and for once didn't complain about the tomato, which I assume was the magic work of bacon. I love the idea of doing this as a salad and cutting out extra carbs! This salad looks good. I need a little extra something in my salads during the winter. This one fits the bill. This salad is delicious. And I love your book! I have made this salad but without the avocado. The next time avocado will be in it. It's nice that you give us these good recipes and on top of it chances to win good things for our kitchens. I have your book and thank you for adding the three weeks of meal plans –I have put them to use. Looks good! Do you have a technique for dicing avocados? I do not buy or cook with them much & really am not sure how to dice them. They always seemed so soft to be able to cut up when I have bought them in the past. Thanks. They should just have a little give to them when they are ready to eat. Yours may have been overripe which makes them just turn to mush. Another trick is to pop the little stem part out and if its brown underneath it's too ripe…should be greenish turning brown. If no ripe ones are available they will ripen just fine on the counter. Take a big sharp knife and going the long way through the center (up and down) cut through until you hit the stone, and just spin your knife all the way around. It should pop open easily if its ripe. To remove the stone, give it a good whack with your knife and turn – should pop right out. I like taking a pairing knife and scoring the avocado insides just down to the skin (not all the way through) in whatever shape/size you want your chunks – if u want a dice just make a grid. Then take a large metal spoon and scoop it out by running the spoon along the skin from one side to the other. Will give you picture perfect cuts! I'm sure there is a great youtube video of this is you need a visual. Knife to scissors! want to race? That salad looks So great. This sounds so good right now! I'm ready for lunch! The salad sounds perfect! Definitely going to try that one. So funny that this recipe was posted today because this is exactly what I'm making for dinner tonight! Can't wait to try it. I've been making recipes from the book almost every night since I got it for Christmas. Love it! This looks so wonderful!! 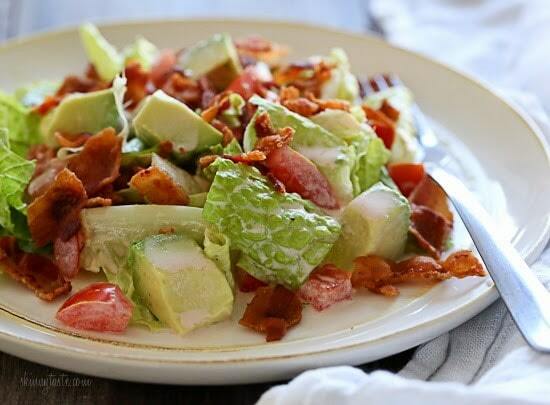 I love BLT salads with avocado! I didn't have any issues! I use a ceramic knife to cut lettuces, but I think if one doesn't eat it up within a couple of days, no matter what you use, it'll turn brown. That's my experience. A nice summer salad for a camping trip for sure. Thanks for the opportunity for a chance to win the give away. I am always looking for ways to change up my salad! I'm 39 weeks pregnant now and trying to make these final weeks count with some healthy food! This looks GREAT! This is one of my favorite recipes in the book! 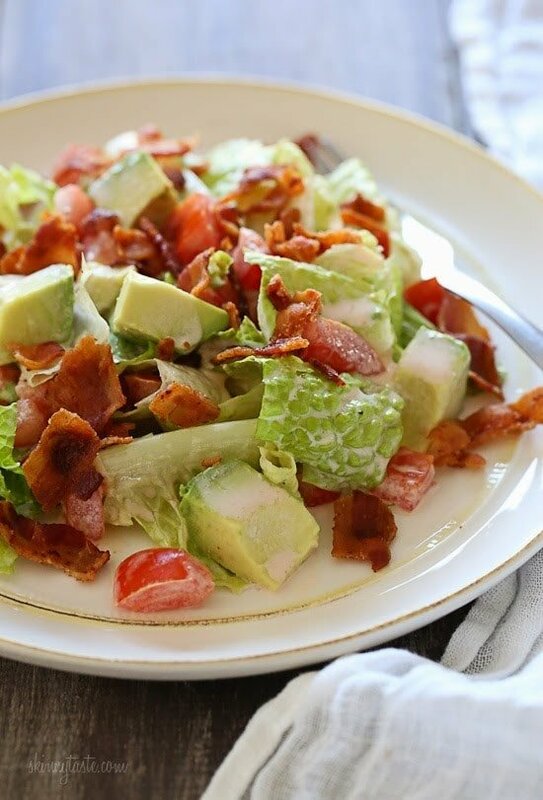 So simple and delicious – the combination of BLT is the best flavor. This salad looks fantastic — and now that I'm through the hump of my nauseous first trimester, the idea of salads is sounding pretty awesome again! And what a great giveaway. Aww, congrats on the baby! That's really more information than I want to know. Me TOO!! Getting through my first trimester still but salads are sounding better than a lot of the other stuff out there. And they are easy too!